This stone-built, detached barn conversion is in the centre of the historic town of Much Wenlock and can sleep four people in two bedrooms. 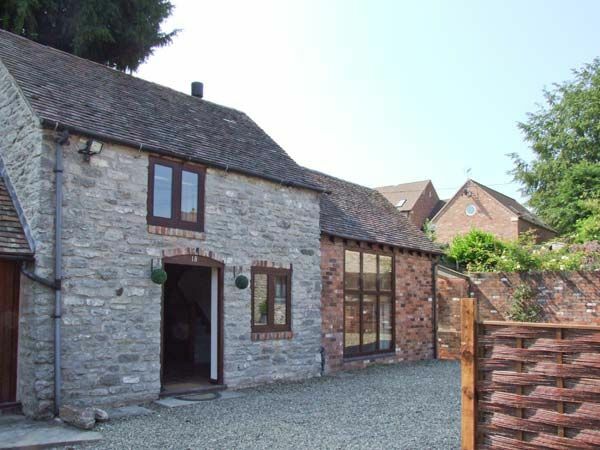 Roosters is a stone-built, detached barn conversion in the centre of the historic town of Much Wenlock and can sleep four people. This cottage has a king-size double bedroom with TV, a twin bedroom, a shower room, a separate basin and WC, a kitchen, a dining hall and a sitting room with a woodburning stove. Outside there is off road parking for two cars, secure bike storage, an enclosed front patio and gravelled courtyard with furniture and a barbecue. Roosters is a wonderful base for your romantic break in Shropshire. Town: Much Wenlock is an attractive, historic market town amid beautiful Shropshire countryside. Dating back over 700 years, a trip to Much Wenlock is reminiscent of stepping back in time, as you stroll the twisting streets, past the quaint cottages and timbered buildings, browsing the speciality shops or stopping in the traditional pubs and good restaurants. The remains of the 12th century priory retain a real sense of the grandeur of the original building. The area around Much Wenlock offers excellent walking, riding and cycling, not least along the wonderful Wenlock Edge, a 15 mile ridge which rises over the town and offers glorious views. Visit Ironbridge, Ludlow, Stokesay Castle or Acton Scott Working Farm. Two bedrooms: 1 x king-size double with TV, 1 x twin. Bathroom with bath, shower over, basin and WC. First floor basin and WC. Kitchen. Dining hall. Sitting room with woodburning stove. Gas central heating with woodburning stove. Double gas oven and hob, microwave, fridge/freezer, washer/dryer, dishwasher, 2 x TVs with Freeview, DVD, iPod dock, WiFi. Fuel, power and starter pack for stove inc. in rent. Bed linen and towels inc. in rent. Travel cot, highchair and stairgate on request. Off road parking for 2 cars. Front courtyard garden with furniture and BBQ. Covered patio with furniture. Two well-behaved dogs welcome. Sorry, no smoking. Shops 3 mins walk, pub 1 min walk. Note: There are four steps down from the dining hall to the sitting room, and upstairs there are four steps leading to the double bedroom and bathroom.